March 2011 - Page 6 of 6 - Pebbles, Inc.
Congratulations! Please email your full name and mailing information as well as your choice of Pebbles collection to pebblesincdt(at)gmail(dot)com and put “Scraplift Winner” in the subject line. 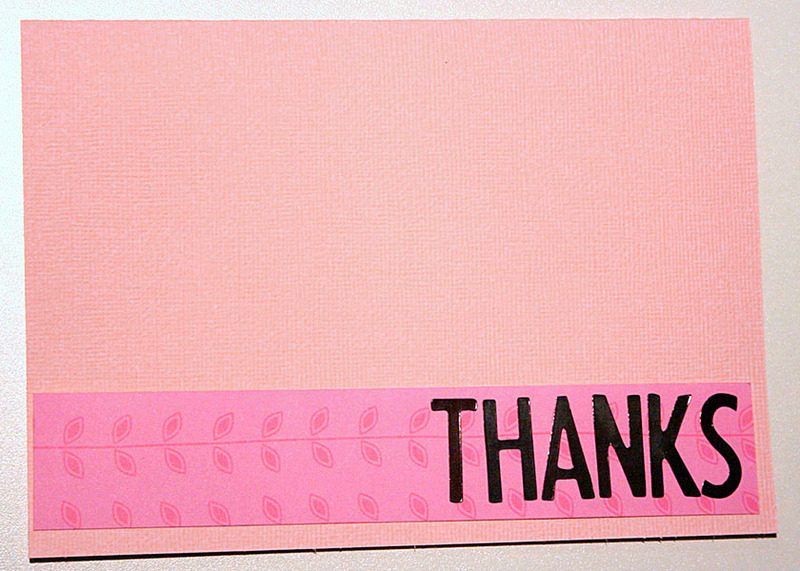 Start with a 5×7 card, made from pink cardstock. 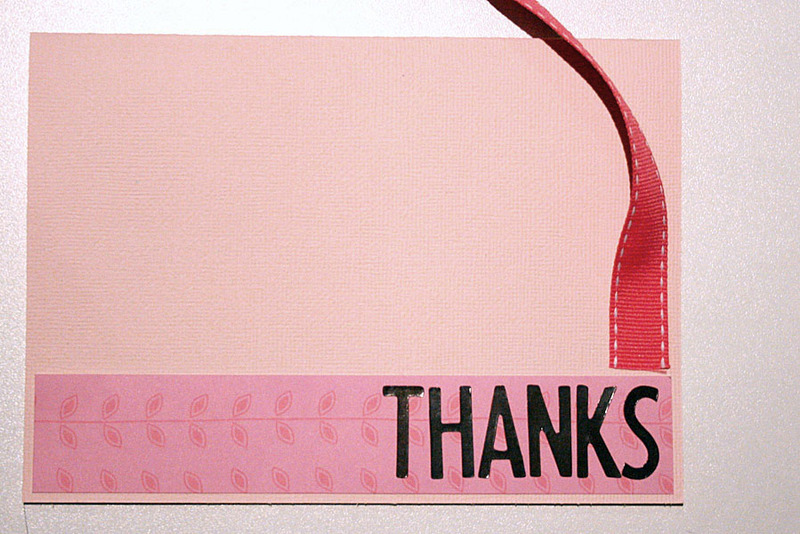 We’re going to add our sentiment first by adding the word “Thanks” using the Buddy cardstock stickers to a 1 1/4″ X 6 3/4″ strip of Twitterpated “Charm” patterned paper. Adhere to your background. Next, grab a length of Pebbles ribbon. I like to use something with a white accent stitch or polka dot, as it adds interest. Preferably, you should use the whole length from the spool – for maximum twisting and turning! 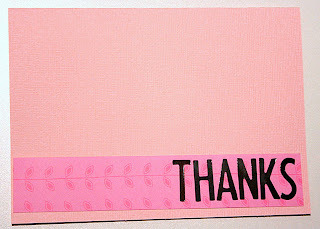 Now grab some glue dots, or double-sided tape and adhere one end of the ribbon just above your sentiment on the right side of the card. Here is where the fun begins! 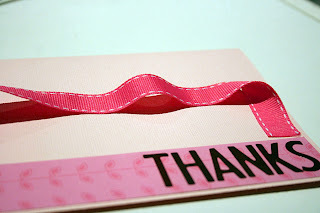 Start to twist and turn your ribbon in different directions – just see what feels good to you. Any time you do a turn, or twist, add a glue dot to secure the ribbon. For instance, I began with a 90 degree turn. 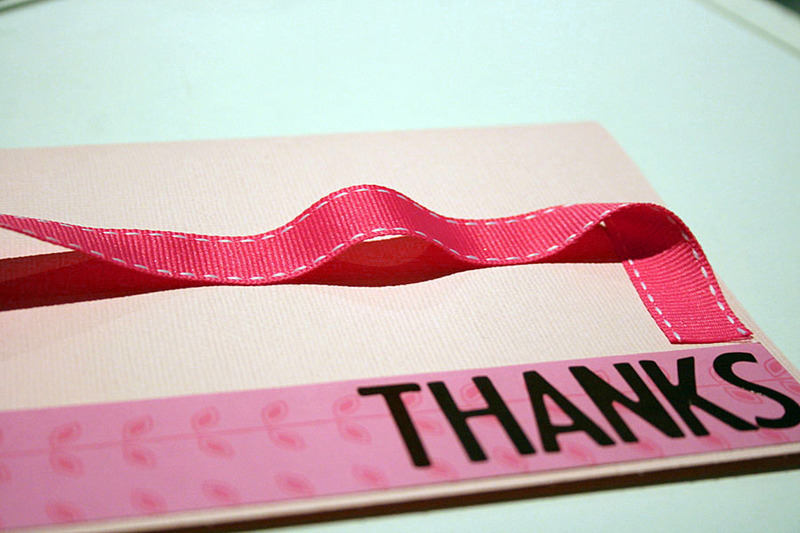 I placed the glue dot AFTER the turn, so that the ribbon still puffs up and adds dimension. 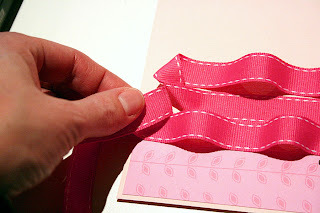 Create bumps by adding a glue dot and then pushing the ribbon back toward itself before sticking it down. 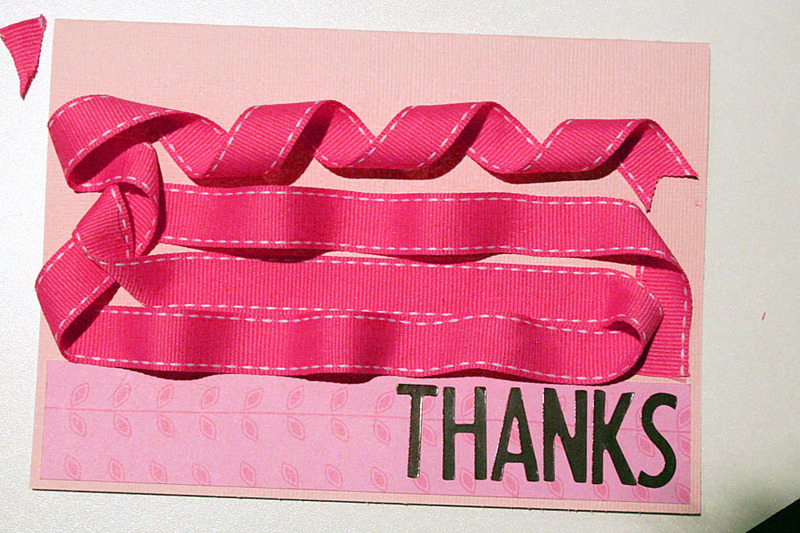 Consider threading the ribbon through previous lines, for a woven effect. 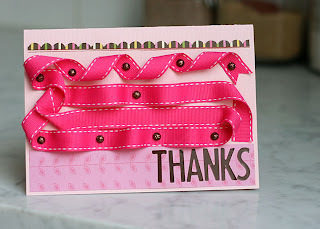 Continue to turn and roll your ribbon until the surface of the card is covered, save for 1/2″ at the top– almost like creating a little maze of ribbon. Then snip the end, if you have excess. 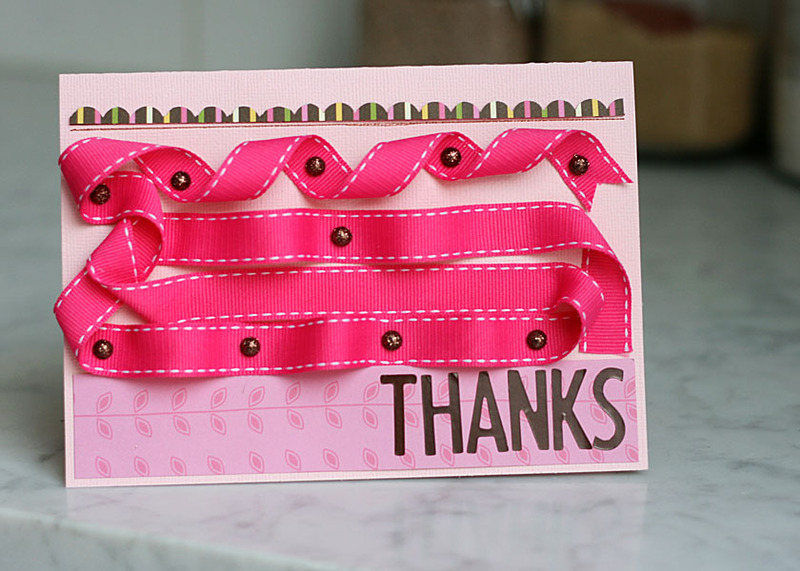 Now, add some candy dots to your ribbon. Use the spots where you added a glue dot as a guide. These will act as visual “rivets”, and it will look like the candy dots are holding the ribbon down. 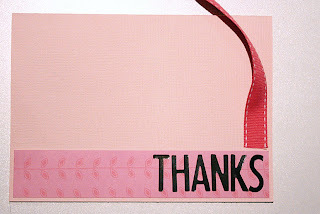 Finally, draw a pen line above your ribbon, 1/2″ from the top of the card, in brown pen, and top with a scallop punched 1/4″ x 6 3/4″ strip of Twitterpated “Delight”, to balance the brown in the title, and frame your ribbon work. And there you have it! A lovely, intricate ribbon card for someone on in your life who deserves a very special thank you!